Natalie Butterworth is quiet and compliant, pushing away her own thoughts and feelings to go along with what everyone else wants. She never stands up for herself or challenges the actions of others so she does nothing when her mum and sister take over the planning of her wedding. They plan everything to their own taste and even buy Natalie a wedding dress without consulting her first. Natalie hates the dress but she doesn't say anything for fear of hurting their feelings. Weeks before her wedding to Olly, Natalie and her best friend go to see a hypnotist show at their local pub and Natalie ends up being hypnotised to tell the truth whenever she's asked a question. But by the time Natalie realises what has happened to her, hypnotist Amazing Brian has disappeared. Natalie must track him down and reverse the spell before she wrecks her relationship with Olly with her brutal honesty and he calls the wedding off. From the very beginning and through to the end, Yours Truly is laugh out loud. I couldn't wait until Natalie was hypnotised as the people who needed a few home truths clocked up and when it happened I wasn't disappointed. I was grinning, knowing what was about to happen, as Natalie's fiance asked 'How was that, then, baby?' after a bit of passion. There are lots of brilliant moments in the book when telling the truth lands poor Natalie into trouble and although I was cringing on her behalf, it was great fun. I loved Little Trooley, the village where Natalie ends up during her search for Amazing Brian, with its eccentric - and heart throb - characters. I wouldn't mind being snowed in there at Christmas. Yours Truly is my perfect kind of chick lit; funny, lighthearted and with a bit of romance sprinkled on top (and not a designer shoe or handbag in sight). It was an absolute pleasure to read, especially as it is set in the North - I'm afraid I got rather excited with the references to Picadilly Gardens and Key 103! I thought the cover was perfect and it reminded me of Lisa Jewell's cover for Thirty Nothing, which is one of my all-time favourite covers. Kirsty designed the cover herself and you can see how it came about and grew over on Novelicious. I would urge any fans of chick lit or romantic comedies (or any other variation of the genre) to give Yours Truly a go. I can't wait to see what Kirsty writes next. 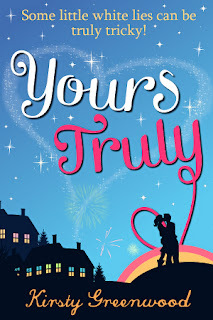 Yours Truly will be launched tomorrow (4th July) and Kirsty will be celebrating with giveaways on Novelicious and Twitter. Fab review, I have this on my wish list - it sounds great!